Find My Workspace lists over 95% of the serviced offices market in Centrum. Simply click Request Quote to check pricing for one office, or Add to Basket for multiple offices. A traditional Canal House located on the famous Herengracht canal. This centre offers fully furnished work spaces which are bright, spacious and maintain large amounts of natural light throughout the day. The modern building also has access to an array of useful amenities to help your business develop such as high speed internet connection and videoconferencing facilities. In addition, there are fully equipped meeting rooms onsite to be taken advantage of, which are excellent for networking and collaborating purposes. Similarly, employees can enjoy the luxurious business lounge, a great opportunity for unwinding outside working hours or for meeting clients. Furthermore, there is extensive support available onsite from professional staff who are able to assist with any queries that may arise. The centre is accessible 24-hours a day as well which allows for overseas networking and seamless transitions between working days. StartDock is the heart of coworking Amsterdam, based on five core values: Collaboration, community, openness, cosiness and accessibility. We want start-ups to naturally grow fast, by sharing and caring. StartDock offers office space, events and a safe haven to start-up your business. Inside our close family of enthusiastic entrepreneurs nobody’s business competes with any other Docker’s business, causing joint growth by sharing thoughts, resources and network. At StartDock, worklife is better. We want start-ups to naturally grow fast, and stimulate this growth by facilitating the optimal ecosystem to live in, as an entrepreneur. You alone can do it, but you can’t do it alone. We have different workspace options; basic desks, premium desks and private office. We offer the right office space or desk for every entrepreneur that wants to grow. 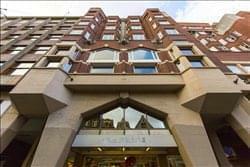 This business centre is located in the dynamic city centre of Amsterdam. It is the perfect location for you if you are looking for a spacious and modern office space, in a historical building. This monumental architecture known as the Klockhuys dates back to the 17th century. With 3 clocks on its façade, the historical and modern features of this centres are beautifully combined. Fully serviced offices come furnished, with high quality facilities. Plenty of natural light and spacious working areas promote productivity and enthusiasm. A beautiful entrance with marble floors will stun your guests. A serene garden can be used as a social space or to wind down during your breaks. This business centre is based within seven historic and monumental buildings at the renowned and picturesque Keizersgracht. With an extensive variety of stylishly furnished offices the building provides the perfect synthesis of modern comfort and authentic details. Because of the full service concept, the centre offers many advantages for corporate clients of any industry and background, meaning that workspace solutions are able to fully cater for any specific client requirement. With the flexible terms of lease, immediate availability and completely furnished offices no further additional investments are necessary and the process is ideal and easily applicable for all prospective tenants. At this business centre you can use Flex spots including a private meeting room for a meeting with your clients and partners. Are you looking for a working area with a luxurious appearance and representative rooms where you can receive your customers? Then you are at the right address!. This centre focuses primarily on lawyers and jurists. Unique is the Full Service Concept for a very reasonable price. You can use all the facilities with an all-in rate guaranteed! The Full Service Concept includes: A luxurious working space with all Office facilities, professional reception for your guests in stylish surrounding, telephone answering services with your own 020 number, use of the meeting rooms for e.g. customer contacts, a prestigious business postal address, free coffee/tea and free Wi-Fi. This office facility offers nothing less than the best turnkey office space one can find. It comes in various sizes, fully furnished and equipped with every facility expected from a high-end office building in the 21st century. The top-class services include a warm welcome for tenants and guests, assured by experienced and internationally oriented receptionists. They can also handle mail and act as a call-centre. The business centre is guarded 24-7 and equipped with a state-of-the-art security system. Five high-end boardrooms, equipped with the latest media, presentation and conferencing facilities are available. Refreshments are provided and served by staff and lunch or dinner can also be served in the boardrooms. The beautiful interior, designed by multiple award-winning agency Tank, radiates a high-class modern look and feel. It underlines the overall sense of excellence of the building. This centre is located in the dynamic city centre of Amsterdam, and is the perfect location for you if you are looking for an office space in a breathtaking, historical building. The style and grandeur of this centre is inspired by another iconic building from Amsterdam: the famous Rijksmuseum. The office building is a perfect mix of modern influences and rich history combined, but where the authenticity is kept well preserved. Stained glass windows, an impressive staircase and spacious, light office spaces: the centre is without a doubt a high quality office location. It also has a modern reception, several co-working spaces and an imposing styled room as a meeting room. This new co-working space is located in one of the most famous buildings in Amsterdam, giving your business a prestigious, recognisable presence upon occupancy. Built in 1899, this building was originally Amsterdam’s Central Post Office, and offers a rich working atmosphere steeped in history. The centre is full of character with old wooden flooring throughout and fully equipped meeting and conferencing rooms where you can hold important meetings and plan your next business move. The space has old-school popcorn machines throughout and an activity room where you can relax, play and networking with fellow members. 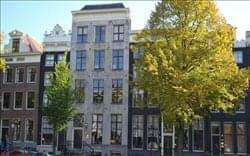 This business centre is located in the heart of Amsterdam, in a historic neoclassical building. You can drop in and work in the lounge, take a dedicated desk or a private office, all accessible 24 hours a day. With private meeting rooms, reception services and a voicemail service to keep you connected, you can run your business with ease at this centre. Here, there is IT support to help you stay well connected throughout your occupancy, and the meeting rooms are well designed to enhance focus and productivity. The centre is the perfect workspace solution for forward-thinking companies that value practicality, convenience and accessibility. This brand new business centre makes renting flexible offices in the centre of Amsterdam possible and affordable. The office building has probably the most central location you can image. The 1958 building meets all the demands of a modern office building, and provides a pleasant working atmosphere that will encourage focus, efficiency and productivity. You and your colleagues can collaborate in elegantly designed meeting rooms. Onsite, there are support services to help your business run as smoothly as possible. For example, you can take advantage of the centre’s management team, IT support, and reception services. Here, you are provided with a creative space in an inspiring environment that allows you to work your way. Check your email, and meet with clients, take a desk or an office, however you work the super-fast unlimited wifi ensures you can work quickly and efficiently. The friendly staff are on hand to answer any questions you might have, leaving you to kindle your entrepreneurial spirit with the enthusiasm of the other workers you will meet and network with at this creative, social hub. This is the ideal workspace solution for companies that value practicality and want to flourish under the best conditions. This fantastic collaborative workspace is situated by the canals, close to the centre of Amsterdam is great for those that do not wish to work in a conventional office. It is a short walk from the city center and offers members panoramic views of the Amsterdam canals, along with convenient access to restaurants, nightlife, and leisure. 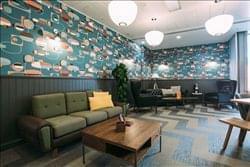 Amenities such as private phone booths, comfy break-out areas and complimentary fruit infused water give everything possibly needed to tenants throughout the working day. The space also has on-site bike storage for those who like cycle and on-site management to help you with everything you need. This centre offers an environment with an emphasis on community and aesthetics. It offers both private serviced offices and shared space, with a multitude of breakout and communal work spaces which enhances collaborative success. It also provides infrastructure, services, events and technology support to help your business operate more efficiently and stay well connected. This centre is suitable for all types of businesses, whether they are start-ups, freelancers, small businesses or large corporate companies. The versatility of these furnished offices showcases the adaptability of this centre as a turnkey solution. To obtain information for your selected Centrum Serviced Offices, please tick the "Add to basket" box for each office you prefer and complete the form below. We will then send a detailed report via email.